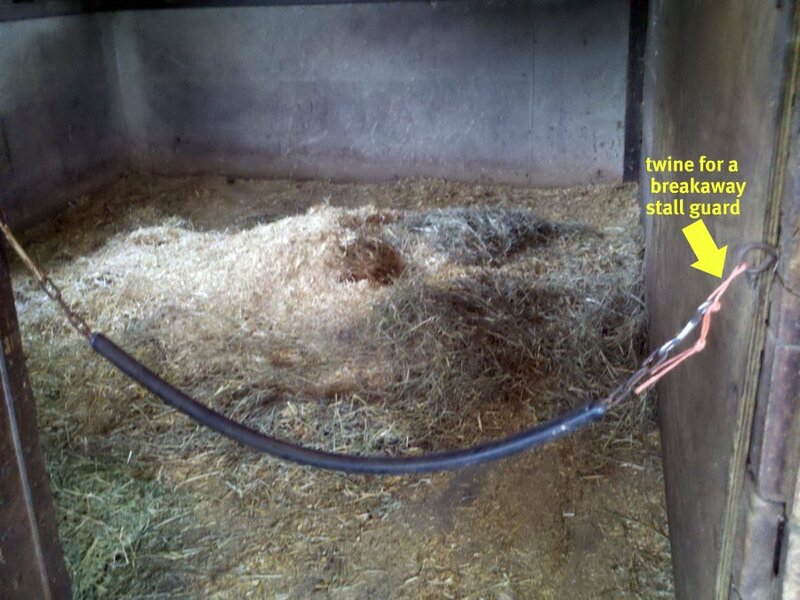 All stall guards should have twine at one end! A few years ago, I was chatting with a fellow boarder. She's from the UK and is a wonderfully experience and practical sort of horsewoman. She noticed my stall guard, pointed to it, and wagged a finger at me. "Your horse could get seriously hurt." Or rather not done. I had the rubber-coated cable stall guard stretched across Harv's stall, attached to screw-eyes with clips. My friend had seen a horse put a leg over the stall guard and get caught -- he pulled back, but the screw-eye didn't give--the horse thrashed around and got seriously hurt. You never want to put stuff around horses that isn't breakaway. The quick, easy fix is to take baling twine and wrap it around the screw-eye, and clip the rubber guard to the twine which would break (a quick release!). Okay, get it. I'm evangelized. Now, the problem I have is, when barn workers clip the stall guard, they don't use the twine, but clip to that darn screw-eye. Doggone it! Once again, Stacey the crazy horse lady has to complain and orchestrate the staff's handling of Riley and Harv. This is rule #7554, I'm sure. I feel sorry for the people caring for my horses, but safety first. Every stall in the barn has these stall guards and they're in constant use. I tell other boarders about the safety issue, but not everyone seems to believe that bad things can happen. Harv and Riley are the only ones with the twine stall guard. Good tip. Also, for those who use the nylon weavign guards, put a t-shirt over them to prevent the horse from getting caught within the weaving. you could tie the stall gard directly to the screw eye and leave a snap on the side that is opened/closed, this way workers wouln't have to clip it back to the twine every time they enter the stall. 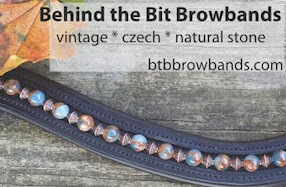 What about attaching the twine on the other side of the clip so that it is between the chain and the left side of the clip? That way the barn workers could attach the clip the way they want to, and you would be worry-free since the twine is still there to break if necessary. Why not put the twine between the hook and the chain, at least if the shown chain is the one you use? I assume they always unhook the clip from the eye, rather than the chain, as you wouldn't want it hanging there. Do they usually open stall guards from one end? (I always unsnap the end away from the sliding door, because with bulkier guards it helps keep them out of the way.) I'd switch sides, or maybe attach the twine directly to the stall guards and then the snaps to that -- less chance of it being reconnected wrong! That's a very good safety tip. Beware of those screw eyes too. I was leading a horse out of stall just like that, caught the blanket on it and the horse jumped completely out of his blanket (it was on loosely apparently). Amazing the horse didn't get hurt, but it was only by the grace of God. You could put the twine between the clip and the chain. That way the clip would be at the end, rather than the twine and everyone would be more likely to do it up right. I use the twine on my crossties too, so if a horse starts thrashing around the twine will break. It is hard to tell from the picture, but it looks like your breakaway twine is on the side of the stall guard that is always open and closed (or at least it is always the right side we open and close at our barn, so maybe I'm projecting). If you do only have a quick release twine on one side of the stall guard, you could move the twine to the side that usually left hooked up. That way, no one has to think they are being put out by having to clip into the twine rather than the eye-hook. I'm rambling... does this even make sense? :) Love your blog, keep at it! I was always told not to use baling twine for breakaways, because it wouldn't give in time to prevent injury. Interesting. Why not put the twine on the side that you don't unclip? It will still give in case of an emergency, but you don't have to worry about the workers. Instead of putting the twine on the eyebolt, can you put it between the clip and the chain? That way the staff doesn't have to fumble with the extra bit of twine but you still have the breakaway. What about only using the twine on one side (whichever side the staff don't normally unclip), so that they can clip it to the ring which is quick and easy for them, but you still get the emergency twine (technically it only needs to break on one side so the horse can get out, not on both). Daughter learned this in Pony Club but was told to always use the natural baling twine - not the polyester kind - because it won't break as readily. I've seen countless horses break stall guard snaps, no problem (it's why I don't ever trust a stall guard) but I watched a horse get seriously hurt because he got tangled in baling twine and it DIDN'T break. If the twine didn't break I imagine it was doubled over too many times. Horses get hurt in so man ways! Ri and Harv have both "broken through" their stall guards, but I hthink the snap would not give so readily, and I fear that harv in particular would get so worked up he'd hurt himself. I've used this kind of twine on everything that should have break away stuff and most of the time it doesn't break! Sneaky twine. So I always use the natural, ugly, brown twine for the stuff I need to break. and don't feel bad about the whole rule #766575757. My horse is so high maintenance its ridiculous to some of the workers (supplements, turnout sch., blanket, fly mask, etc), but hey I PAY for full care, I should get it. I give everyone elses horses the specific care they ask for, why not mine eh? Take away the choice. Instead of twine, remove the normal snap and replace it with a quick-release snap. My old barn tied the lesson horses to the bar with these + chains and if a horse freaked out, the snap always prevented injuries and gave. Two points. First is that twine, does it really beak over the more rustic twine? and Second (I should get an award for this) find a ring, like from a halter you are going to pitch. Use the twine to tie that ring to the eye bolt. Then the barn staff can use one hand to clip the guard to the ring. Good for you! Accidents do happen and whatever we can do to minimize injuries we should do. A friend of mine just had a horse die because of a freak accident. No one should have to go through that! This is a v. informative post. There are so many things out there that a horse can find, and get hurt. I have an idea instead of twine - Equi-ping. http://www.bitofbritain.com/Equi_Ping_p/3449.htm I haven't used them myself, but I think I'm going to buy my BO a few doz for her birthday. I feel like they should be everywhere. When horses are tied to trailers, or in cross ties (though we use panic snaps), or why not stall gaurds? Maybe they give too easily for that one? If so, contact the company, and see if they'd make a stall gaurd one. I had never thought about this. I don't use a stall guard but I know many people who do so I will be sending this to them! Here is an idea to help your twine/stall guard issue. Put the bailing twine on the chain link between the double end snap and the chain link (on the stall guard) instead of on the actual screw eye. 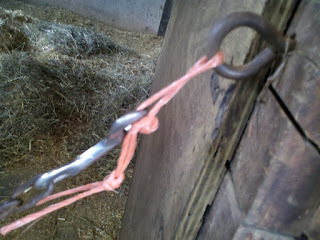 The stall guard will still be "break away", and the barn help can just use the snap/screw eye as usual. I would either put the twine between the clip and the chain instead. OR, I would buy a set of Turtle Snaps. Cut off the nylon strap, use a connecting link to attach the Turtle Snap to the chain, and have that as the end to the stall guard. If the horse puts any pressure on the Turtle Snap, it will break/undo easily. It's been my experience that the metal clip will give before the plastic bailing twine - even just a single loop. Of course, that was a large mare leaning on the stall guard, not leg caught over the top, although it did snap the whole end of the trigger snap off.